Viking Vanguard sees you board a long ship as you join a horde of vicious Vikings on conquests across the stormy seas as they trade and raid their way across Europe wielding their swords, spears and axes before packing out their long ship’s with highly valuable goods before returning home to their Scandinavian fortresses. The transparent reels enable you to take in the stunning snow-covered mountain landscape with a large castle in the near distance and there is a rather dramatic and sinister soundtrack that accompanies gameplay which really makes you feel part of the action. Of course, it’s not the first time that we’ve reviewed a slot based on the Vikings as we also checked out Big Time Gaming’s Viking Quest slot which took a more fun approach to the theme, but with stacked Wilds, a guaranteed Wild reel on each and every spin, plus an extremely rewarding free spins mode that will see you loot the reels in less violent manner than the Vikings during their invasions, Viking Vanguard is certainly the best we have encountered! This spectacle takes place across 6 reels and 60 fixed paylines, following on from the mighty success of fellow WMS slots like the Zeus III slot machine and the Raging Rhino slot machine which are also played across six reels. With a hefty return to player percentage of 95.90% the value is evident, plus you’ll not need Viking-sized stakes to spin the reels either as you can play from 30p up to £90 per spin. Often we stunningly designed backgrounds that set the scene perfectly only to be presented with dull and boring symbols that leave a taste of disappointment, but once again WMS have done an incredible job designing detailed symbols to fit in with the Norse theme. There is a stacked Wild symbol that is represented by the eye of a Dragon and in addition to being able to substitute for all other symbols aside from the Bonus symbol, a stacked of Wilds appears randomly on one of the reels each and every spin which always boosts your odds of winning. The Bonus symbol here is the red silhouette of a tree. In addition to this you’ll encounter a muscle-clad Viking warrior with long locks of blonde hair who is clutching old of his sword and he covers two positions rather than one, a female warrior, a Raven, a Wolf, plus a variety of Norse related symbols and artefacts which have the lowest payouts of all. The reel which appeared as a Wild stack on the spin that you trigger the free spins feature will also remain Wild for the duration of your spins – and that offers a significant boost to the number of winning combinations that you’ll enjoy, especially if you achieve the greatest feat of triggering 100 free spins! That’s still not all though. Up to five reels can randomly be transformed into Wild stacks too for colossal wins, there is a Bonus Guarantee feature incorporated that sees you guaranteed to win at least 5x your stake (just like the Montezuma slot machine), plus you’ll have the opportunity to trigger additional free spins - 3 Bonus symbols earns you 8 more free spins while 4 Bonus symbols earns you 20 more free spins. 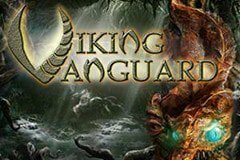 The graphics in the Viking Vanguard slot machine are absolutely stunning with transparent reels setting the scene perfectly, plus adrenaline pumping sounds that make you feel like you are participating in a vicious Viking battle. While there are big wins to be had in the base game, the free spins mode is legendary (offering up to 100 initial free spins) and will see you land wins that you’ll be recounting over and over again just like the adventures of Vikings have been!